A microphone is an important part of your PC, and it plays a major role in your business. Various business organizations use voice over internet protocol, such as Viber and Skype. In this situation, it is important to have a microphone to talk to your clients and employees. Various VoIP programs have built-in methods to check your microphone. 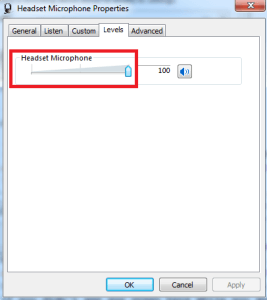 If you want to learn How to Test Computer Microphones on Windows 7, you can get the advantage of its native function. 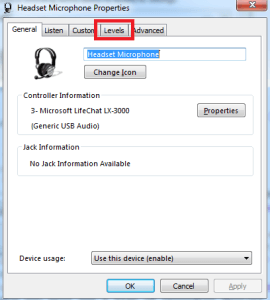 The recorder function of Windows 7 will ensure the working status of your microphone. In the first step, click “start followed by all programs, accessories and sound recorder”. Make sure to plug your microphone and open your sound recorder correctly. If your microphone is not plugged in correctly, you may receive an error message. Hit on “start recording” and speak a phrase directly into microphone. After speaking some lines hit “stop recording” and wait for a window to open automatically to save this recording. You can write the name of this file and save it an easy-to-access location. 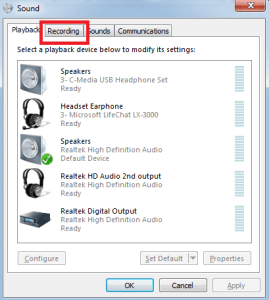 Now double-click on the saved recording file, and if the sound is clear, then your microphone is working appropriately. If you are unable to hear anything, see the following instructions below. How to fix the microphone settings in case of any problem? 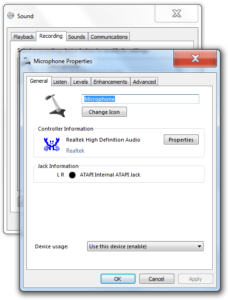 After learning how to Test Computer Microphones on Windows 7, it is important to learn the methods to resolve any problem with your microphone. If your microphone is not working, there might be something wrong with your settings. Here are a few steps to make this task easy. Click on the “Window” symbol on your computer and wait for a screen to appear. 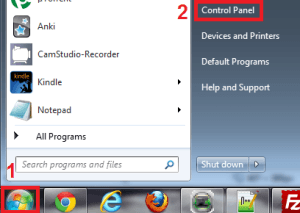 You have to search “Control Panel” on your windows and click on this word. 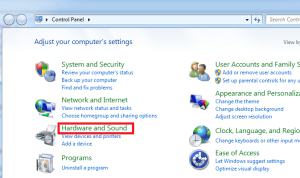 A new window will appear and select the “Sound and hardware” option. You will see “Sound” and you have to click on “management of audio devices” under sound. If the green bars are rising, it means the microphone is configured, but if you don’t see the green bars by speaking into the mic, follow the next instructions. 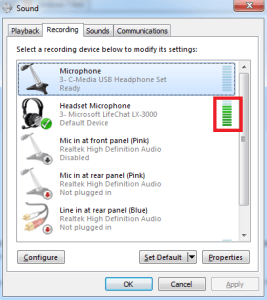 If the green bars are missing while you speak into the microphone, try to recognize the device in the recording list. If you are unable to configure the device, you can select “Set Default”. Now double-click on your device and in the opened window, hit on the “Levels” tab. Now, check again by speaking into the microphone. If green bars appear, your receiver is fully configured. 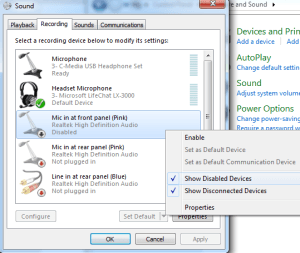 If you see any disabled device, you can enable or activate it to configure the settings of your microphone. Open a task tray by right clicking on your Sound icon. Open volume mixer and increase the sliders to make the volume 100 percent. In the properties of Microphone, make the level 100 percent and check if anything is muted. Slowly boost the slider of your microphone. Keep it in mind that 100 percent level can damage your speakers so keep it less than a hundred. Click okay again and test your microphone. If you notice no activity in the level indicator of volume, you have to click on “Microphone” and click on the “Enhancement” tab. 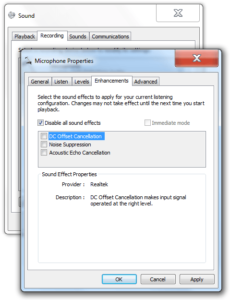 Check the option “Disable sound effects.” Hit “Apply” and “Ok.” Test your microphone again. 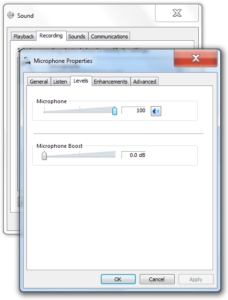 If you still have an issue, open the properties window of Microphone and hit on “General” tab. Open properties window. 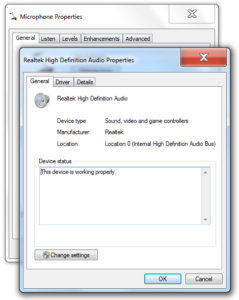 Change the settings of “Realtek Definition Audio” window and hit on the change setting button. Click on “Driver” tab and uninstall it. Confirm uninstall and restart your window. 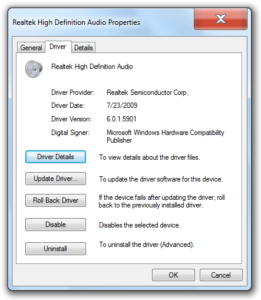 Your problem may be resolved, or in case, the problem is still there, you can install your sound drivers again. 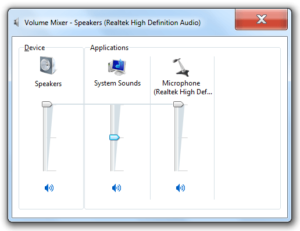 Windows 7 has a built-in microphone control, and you have to configure this microphone to get its advantage. If your microphone is not working, there may be some problems in the configuration. 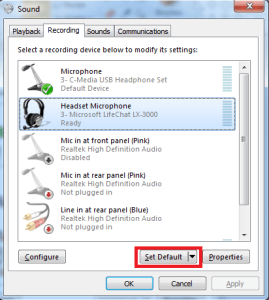 You can follow the steps “How to Test a Computer Microphone on Microsoft Windows 7” to check the working status of your microphone. 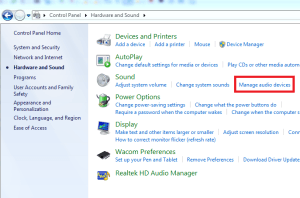 This tutorial will help you configure any problem with your receiver and the sound system for Windows 7.